Youssou Ndoye went eye-to-eye with “the spider.” He wound up picking up 2 quick fouls and was never a factor in the game. 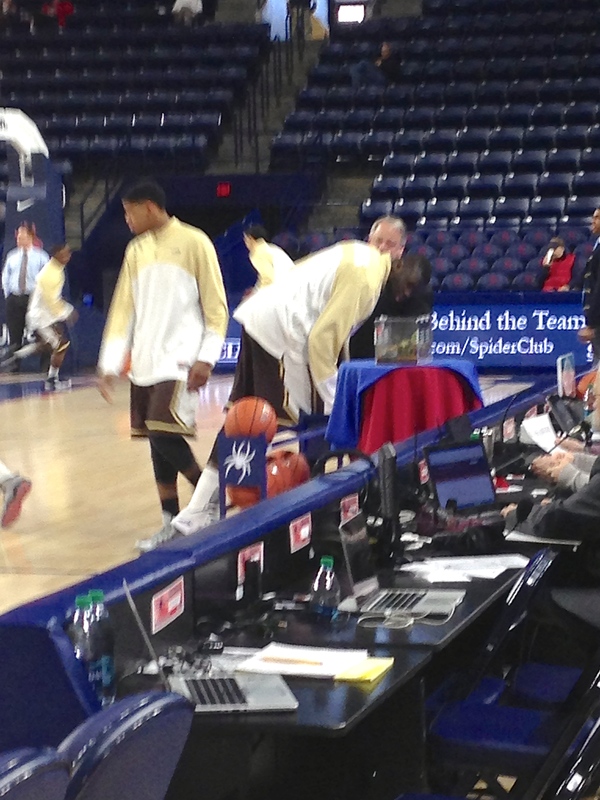 Note to self (and possibly future visitors to the Robins Center): leave that arachnid alone. In a game where the score was 10-4 with 11:47 minutes to go in the first half, the last thing anyone expected to see was some hot shooting from either team down the stretch. The Spiders went ahead and provided the makes in the second half and came away with a 60-41 victory over St. Bonnies. The score was 25-23 in favor of Richmond at the half and most patrons had to be thinking, “I’m missing the playoffs for this?” Neither team could find any sort of rhythm or flow on offense during the first 20 minutes. Youssou Ndoye, the Bonnies 7ft center, picked up 2 fouls in the first 4 minutes of the game and was never really a factor for the rest of the day. He finished with 4 points, 6 rebounds, and a block in 20 minutes of action. The Bonnies had to have been feeling pretty good at the half only being down 2 and having been whistled for 11 fouls in the first 20 minutes. Those good feelings went out the door, hit Boatwright, and made a dash for the James River once the second half started. Richmond’s match-up zone gave the Bonnies fits, holding them to 7-28 (25%) shooting for the rest of the game. 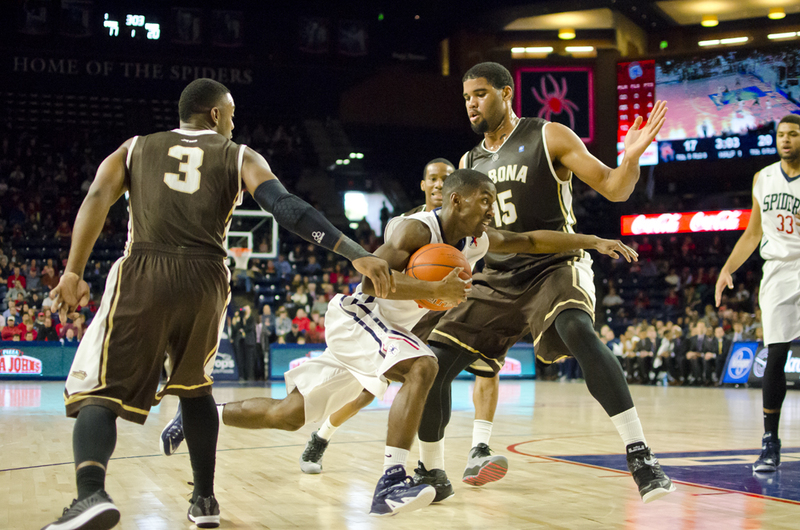 In contrast, the Spiders went 14-25 (56%) from the floor in the second half and outscored St. Bonaventure 35-18. Alonzo Nelson-Ododa, an enigmatic reserve forward/center for Richmond, had a big time performance to lead the Spiders on Sunday. Nelson-Ododa finished with 10 points, 11 rebounds, 2 blocks, and 3 assists. His energy and heads-up play really seemed to give the Spiders a big lift. With the score 36-31 in favor of Richmond with almost 11 minutes remaining in the game, a missed 3-pointer by Nelson-Ododa bounced hard off the rim and was grabbed by point guard Kendall Anthony. Anthony instantly found ShawnDré Jones for an uncontested 3 which he drilled, giving Richmond a 39-31 advantage. The Spiders outscored the Bonnies 21-10 from that point on and cruised to the 19-point victory. Anthony and Jones combined to score 24 points on 9-19 shooting, 5-9 from deep. TJ Cline was very effective in limited minutes today for Richmond. Cline was 4-6 from the field and ended up with 11 points but more importantly, he was able to draw St. Bonnies’ big men out from the paint and help create some nice lanes and space for the Spiders to run their offense in the second half. The Bonnies used a true team effort in the first half to stay within striking distance but were unable to find a consistent scorer in the second half. Marcus Posley and Jaylen Adams, aka Swaggy P’s lost twin, combined to go 4-19 from the floor. Throw in Andell Cumberbatch’s 4-11 shooting and you get the gist of the situation. Basketball can be simply defined as a game a makes and misses and today, the Bonnies had way too many of the latter. The Spiders improved to 9-7 (2-1) and the Bonnies fell to 8-6 (1-2.) The Spiders travel to George Washington next while the Bonnies host George Mason. Richmond will be looking to reverse its recent road woes where as the Bonnies will just be looking to get a much needed victory. Is it Too Soon To Think About March Madness?